Canadian author/journalist Jay Bahadur has a new blog called The Pirates of Puntland. Jay Bahadur, a journalist who dared to make his way into the remote pirate havens of Africa’s easternmost country and spend months infiltrating their lives, gives us the first close-up look at the hidden world of the pirates of war-ravaged Somalia. Bahadur’s riveting narrative exposé—the first ever—looks at who these men are, how they live, the forces that created piracy in Somalia, how the pirates spend the ransom money, how they deal with their hostages. Bahadur makes sense of the complex and fraught regional politics, the history of Somalia and the self-governing region of Puntland (an autonomous region in northeast Somalia), and the various catastrophic occurrences that have shaped their pirate destinies. 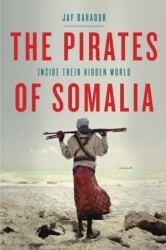 The book looks at how the unrecognized mini-state of Puntland is dealing with the rise—and increasing sophistication—of piracy and how, through legal and military action, other nations, international shippers, the United Nations, and various international bodies are attempting to cope with the present danger and growing pirate crisis. With southern Somalia in the midst of its worst drought in six decades, the world is once again faced with an abominable humanitarian crisis, the most dire since the Indian Ocean tsunami of 2004. But the international community's sympathy for Somalis should not be extended to the pirates plying their waters, a cohort of avaricious and often barbaric criminals who hold no compunction about turning on their own countrymen to make a buck. Piracy has never been directly correlated to hunger and poverty in Somalia; within the country itself, relatively worse-off regions have not spawned greater numbers of pirates, nor has piracy tended to escalate during times of greater hardship. For most young pirates, entering the trade is more opportunism than desperation; more pull than push. Like inner-city youth who turn to drug dealing, the “game” offers young Somali men a chance to taste the respect and status that the circumstances of their birth have denied them. Ironically, the pirates' vehicular obsessions often turn out to be more deadly than their occupation. Most lack even a high-schooler's ability to drive, a fact attested by the broken-down four-wheeler chassis that routinely line the embankment of Puntland's sole paved highway. One pirate in the Victoria gang, drunk for the first time, came within a few tire spins of driving off a cliff, his demise averted only by his passenger reaching across and jamming his foot on the brake. Pirate proclivities have not changed much since I was last in Somalia, as was made evident in a recent exposé by the local news site SomaliaReport, whose correspondent visited the pirate hot spot of Hobyo to investigate how the brigands spent their cash. He discovered scores of Land Cruisers abandoned along the beach owing to various problems – in some cases, nothing more than scratches of paint or a cracked windshield, which the pirates considered beneath their dignity to repair. For such trivialities they kidnap, kill, and hijack. The blog and the book are well worth your time. Hat tip to Daniel Sekulich and his blog, Modern Day Pirate Tales. Somali Pirates: A Techno Fix? Scum: "Somali kidnappers want cash for dead body"
Somali Pirates: One Step Ahead? Earth's Water Delivered By Comets?